In Medicare Part A, spending is determined by rules about benefit eligibility and provider payment rates. If the Hospital Insurance (HI) trust fund balance falls to zero, however, spending faces a separate, hard limit: payments can’t exceed receipts. Program operations would thus be disrupted if the trust fund became exhausted. Congressional budget rules ignore the trust fund and assume that spending will continue at scheduled levels regardless of its balance. Under that approach, any spending reductions or revenue increases in Medicare Part A generate new budget resources that can be used to pay for changes in other programs. Medicare Parts B and D operate in a third way. Like Part A and Social Security, their spending is determined by eligibility and payment rules and gets paid out of a trust fund (the Supplementary Medical Insurance or SMI trust fund). But that fund has unlimited right to draw on general tax revenues. A zero balance thus results in general revenue transfers, not operational disruptions. Reforms don’t increase the life of the trust fund (since it can never go broke), and savings can be used to finance other programs. The National Flood Insurance Program operates in yet another way. The NFIP is required to finance itself out of its insurance premiums; if its costs exceed those premiums, it can borrow from the federal government up to a specified limit. 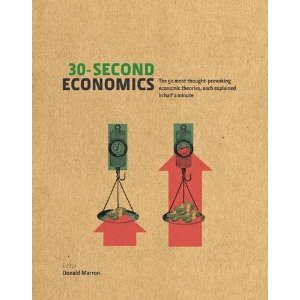 Once that limit is reached, payments can’t exceed its revenues, and operations are disrupted. The borrowing limit thus acts like the trust fund balance in Medicare Part A or Social Security, except that it allows the program to go a fixed amount into the red. Congressional budget rules treat the borrowing limit as a fundamental restraint on NFIP spending. If the program is expected to run annual deficits, as it is today, those deficits exist only until the borrowing limit is reached. After that, the NFIP is projected to break even, with spending restrained to equal revenues. If Congress reduces the annual deficits in the NFIP (e.g., by increasing premiums), those savings allow the program to operate longer before reaching its borrowing limit. Any temporary budget savings thus get offset by increased NFIP spending in later years. 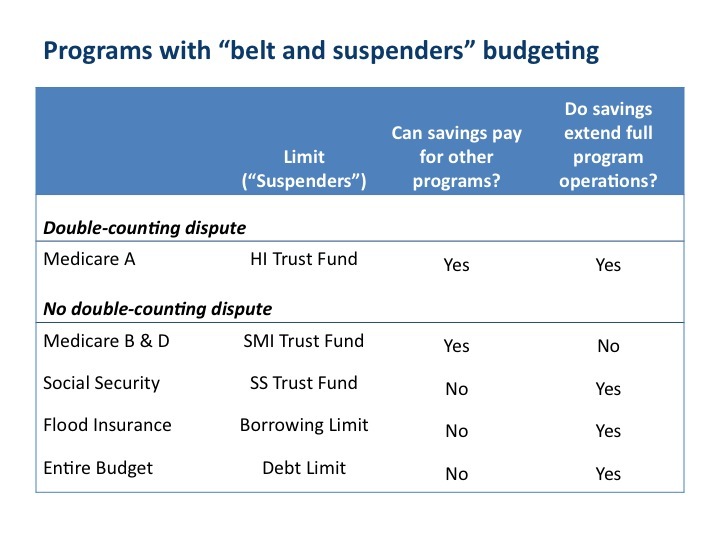 Those temporary budget savings thus cannot be used to offset spending in other programs (unless hitting the borrowing limit is pushed beyond the budget window). The debt limit, finally, acts as a “suspenders” restraint on deficits incurred by the entire federal budget. As we saw last summer, the debt limit threatens real operational restraints. Spending reductions and revenue increases can delay when the debt limit is reached. But they cannot be used to pay for other programs. Why? Because there are no other programs. The debt limit thus operates like the Social Security trust fund: it imposes an important operational restraint, and budget actions used to avoid it cannot pay for other programs. Thanks for this post. It’s probably the clearest explanation of what is going on with the Medicare A “double counting” controversy I’ve yet read. Going forward, Congress needs to amend the budget rules. The problem identified by Blahous is not that Medicare Part A has unusual budget accounting itself, but that these statements are based on different sets of baseline assumptions. The CBO projects Medicare spending based on current expected utilization and no funding constraint, while the latter statement implies a dramatic reduction in benefits in accordance with current law if the fund becomes insolvent. The fact that Congress is unlikely to permit a major reduction in benefits if the trust fund runs out of money is a good argument in favor of the CBO’s accounting choices, but one wonders why this approach is not applied to other situations where there is ample evidence that current law is not true baseline (the doc fix, for example). Granted that finding a true baseline other than current law is an art, we don’t want to encourage ever more fanciful accounting manipulation, such as balancing an increase in current spending with a promise that the government will spend no money in 2020. It’d be nice if the CBO shifted a bit more towards a true representation of the national budget, getting rid of gimmicks like ten-year horizons. it imposes an important operational restraint, and budget actions used to avoid it cannot pay for other programs.